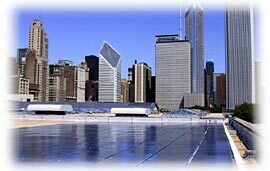 The 51,480 W photovoltaic (PV) power system was installed on the roof of the Art Institute of Chicago (Phase 1). The Institute opened in 1893, and the museum portion, known as the "Grant Park Facility" is located between the lakeshore and downtown Chicago. The photovoltaic installation will be one of the newest (1988) additions, the Rice Building, which enjoys considerable visibility from occupants of the high- rise buildings to the west without significant solar blockage. Millions of visitors enter the Art Institute, which is open Monday and Wednesday through Friday from 10:30 AM to 4:30 PM, Tuesday from 10:30 AM to 8:00 PM, and Saturday and Sunday from 10:00 AM to 5:00 PM. In addition, staff works in the Museum during regular business hours. The Art Institute is open every day of the year, except for Thanksgiving and Christmas Day. The Museum has extensive collections of modern and traditional art, and art and architectural history, the latter of which creates an awareness of environmental values. Its library has over 250,000 volumes. These resources support world-class research and scholarship activities.